The Bearcats will take the football field for their 2009 season opener against Southeast Missouri State in about two months. 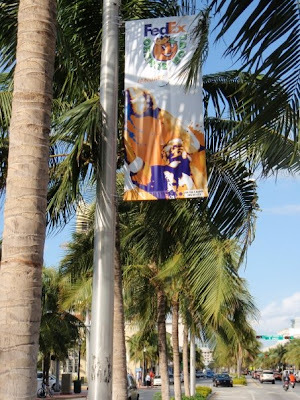 The football program is coming off of one of the best year's in its long history when it won the Big East Championship and earned a bid in the 75th FedEx Orange Bowl. At the same time the program set several attendance records and recorded eight of the top-12 crowds in Nippert Stadium's 85 year history. This success at the box office has continued as the program has sold out nearly half of the stadium to season ticket holders, and for the third consecutive year, sold out the Bearcat Lair section behind the north end zone. 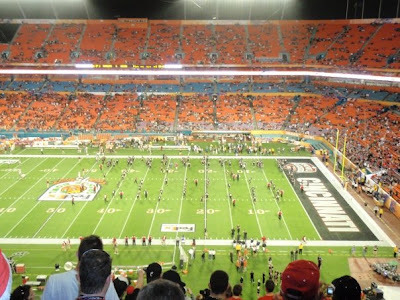 There have been some other moves since the Bearcats walked off the field at Dolphins Stadium in Miami, Florida earlier this year. The most notable of which is the new contract for Brian Kelly which will extend Kelly's contract one year and guarantee him nearly $1.5 million in salary until 2013 according to ESPN.com's Brian Bennett. In addition to adding in more money for assistant coaches, at Kelly's request, the contract also eliminates the requirement for the University of Cincinnati to build a new practice facility for the program by 2010. 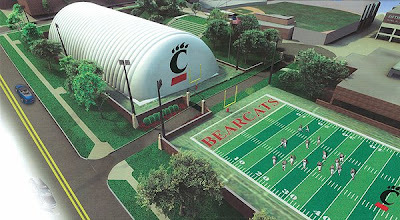 The reason is, of course, financially driven as UC is short on the total amount needing to build the new practice facility that would include an full-size indoor field and a half size field along Jefferson Avenue uptown. This move seems to buy the university some time as it tries to raise money to build the new facility. From the beginning many thought it was a rushed time line to have the facility built by 2010, but had the contract stipulation not been in place then the UC football program would probably not be this far. The continued success and growth of the program depends upon keeping quality coaches and trainers around. UC needs to make a concerted effort to keep these talented individuals here so that they can keep attracting the talent that makes UC as Bowl Championship Series (BCS) contender year in and year out. If the new facility does not get built and Kelly gets an opportunity to bolt, then the program will be branded as a stepping stone program for some time to come. It's up to the University of Cincinnati to decide from here how it wants to play this one. Plans for the facility look nice, much better than the sparse trees and maintenance garage that is there now. The proposed streetcar route would run right along this facility.